Jack's Cupboard combats food insecurity by ensuring those students who struggle financially to purchase food are provided this free resource supported by students, faculty and staff. 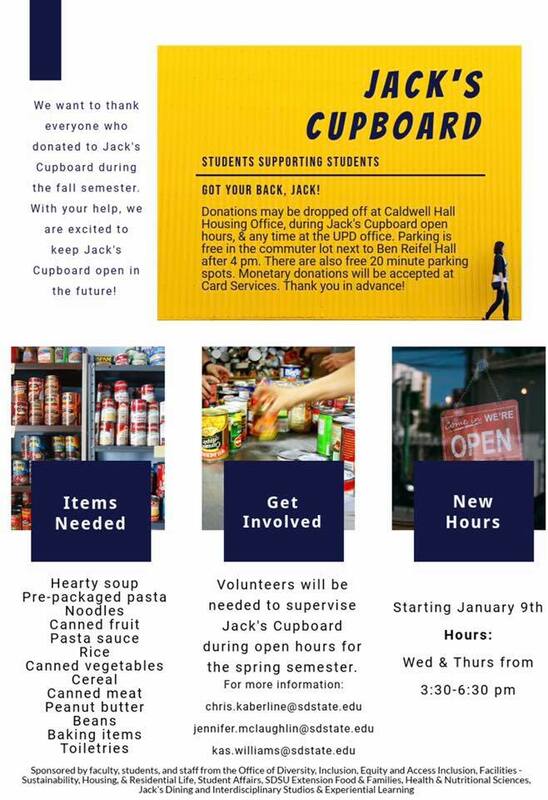 It is available to all students with a student ID and a bag to collect food items (although Jack's Cupboard can supply students with a bag, if needed). Students, with a meal plan, can also donate block meals for Larson Commons by visiting Card Services in the Student Union. Students with leftover flex dollars or monetary donations can contribute at Card Services. All students, faculty, and staff are invited to make a monetary donation at Card Services for meals or to purchase food items for the Cupboard. Donations of nonperishable food items are accepted at Jack's Cupboard during hours of operation, at the Housing & Residential Life Office weekdays from 8:00 a.m.–5:00 p.m. or at the University Police Station (24/7). Jack's Cupboard is located on the SE Side of Ben Reifel Hall, where there are free 20-minute parking spaces available.